Well, it's summertime and things have been changing around here. First off, my daughter Karis has been asking to sleep in a big bed for quite some time now. She is almost 3 and if I had it my way, she would have been in a crib until she was 5. She is my third child and I've noticed that things are just more relaxed when you get to #3. Both my boys were potty trained and out of a crib by 2 1/2 yrs old, but with her???.... naaah... what's the rush, really??? Sometimes we are just happy that she is alive and knows her name. Ha! Yes, there *may* have been times when we've forgotten that we have 3 kids to watch over while in a crowded area. We may have "lost" her for a little bit. This might have happened to me -----> (taking mental count at the campground) ...child #1. check. child #2. check........ (mins pass)... child #3. WAIT. CHILD #3??!!!!! Ok, so before you call CPS I assure you that the family we found her with was a nice looking family. JUUUUST JOKING.... really, I am. So with the pleading request of my 2 yr old daughter, we finally put her in her big girl bed. I didn't think that I was going to be so emotional, but I was. I mean, I didn't even prepare myself for her last time in her crib. I imagined taking her shopping to pick out her new sheets, but it all happened so fast. Before I knew it, I was crying like a baby while she HAPPILY jumped up and down squealing with excitement in her new bed. 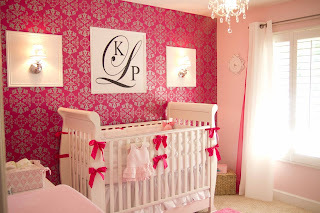 This is Karis' room before. It looked so beautiful with the white crib. Ok, these next pics are pretty bad lighting. I used my cell phone to take these so the room looks purpley. Anyhow, this is the last time Karis was in her crib. She looks sad...doesn't she? Oh, maybe that was me. This is her new bed set up. She was so excited to sleep in it that she couldn't even wait for us to take the crib down. Daddy is praying with her while Mommy is crying in the corner.. with a camera, of course! I just HAD to throw in this pic of my sweet girl praying. Don't worry, all those wires will be covered when we can get a different TV. It wasn't in the budget so we have a temporary one there now. All those wires really bug me. Just a few more shelving and door frames and this room will be FINALLY done! Aren't these so cool? My hubby found these awesome bean bag type seats at Walmart. They are SUPER comfy , our kids love them, and best of all... they match!! So lots of changes here. My little Karis has also been wanting to get out of diapers, too.. but this mama is NOT ready for all this growing up. I have a feeling that she's not going to wait around for me to be catch up to her.